EtusivuTiedote – Finnish Weird 4 is now out! Tiedote – Finnish Weird 4 is now out! Finnish Weird 4 is now out! Come and see what Finnish speculative fiction is all about! Finnish Weird 4: Call of the Weird is now available for free online. Check the webpage http://finnishweird.net for free PDF and EPUB downloads. The latest issue contains articles about and short stories by Magdalena Hai, J. S. Meresmaa and Viivi Hyvönen. The previous issues are also available for free from the same address and include writers like Johanna Sinisalo, Emmi Itäranta, Maria Turtschaninoff, Leena Likitalo, Pasi Ilmari Jääskeläinen, Tiina Raevaara and Anne Leinonen. Have fun and spread the word of the amazing Finnish weird! Finnish Weird 4: Call of the Weird -lehti on nyt netissä ilmaiseksi ladattavissa (PDF & EPUB-versiot). Numero sisältää edellisten lehtien tapaan Tähtivaeltajasta tuttuja artikkeleja ja novelleja englanniksi käännettynä. Finnish Weirdin perimmäinen tarkoitus on esitellä Suomikumman hienouksia suurella ulkomaiselle yleisölle ja tukea näin kotimaisen spefin leviämistä maamme rajojen ulkopuolelle. Joten jos tunnet aihepiiristä kiinnostuneita ihmisiä maailman muilta kolkilta, voinet ystävällisesti vihjata heille vapaaehtoisvoimin toteutetun lehden olemassaolosta. I love your magazine. I have one issue in paperback and I love the short stories. How do I get all your issues in paperback to put on my bookshelf?. 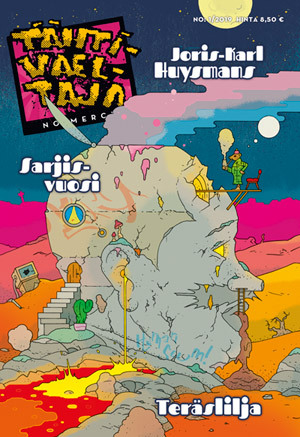 The printed versions of Finnish Weird -magazine have mostly been circulated through the Helsinki Worldcon 75 -tables in different science fiction and fantasy cons all over the world. So we knew it might be a bit hard to collect them all – which is one of the reasons we have also these free versions online. To my knowledge the first two issues are also completely ”sold” out, but I’ll ask around and try to find out if I can get you the issues you need.